I have a few. If anyone has an answer, I'd super appreciate it. Firstly, how the hell does the brand on his hand work? Is it magical? Battery powered? Is it built into the glove or is it coming from his hand? Secondly, is he actually human? I suspect not, but I'm not sure what he actually is. My best guess is he's the spirit of a long dead pirate that can possess the bodies of the dead if they're nearby when he dies, whereupon he literally transforms their meat into a new lobster. I think it's a curse and he's having to make up for some great wrong. It didn't work at Hunte Castle because everyone that died got incinerated, and so he didn't have new meat to possess until that nazi got killed in Conqueror Worm. Thirdly, when are we getting more? Baby wants answers. I've no idea how the brand works. To my knowledge it's never been explained. As for his real nature... he's definitely not just a normal dude. He survives way too many certain-death situations for that to be the case. Middenway had a very similar theory in Hell Notes about the Lobster possessing the bodies of the nearby dead whenever he's "killed". I really like that theory and I think it fits, based on his appearance in Conqueror Worm and the times he took over Johann's ectoplasm. He also seems to have an actual need to dispense justice, beyond just a desire to fight crime (I believe this was mentioned in Hell Notes too). Remember how he seemed "stuck" in Johann's ectoplasm until he reached the ruins of Hunte Castle where there were ghost Nazis to be punished? "There... there it is. Justice." The pirate connection is really interesting and given the emphasis it had in Get the Lobster and The Pirate's Ghost, it definitely seems important, but I don't know exactly how. Is he the spirit of "El Bogavante", doomed to eternally dispense justice as penance for his sins? Do the mentioned descendants of the pirate have anything to do with the Lobster? We know what became of one of his children (if memory serves he was a fur trapper with a family that supposedly could turn into panthers), but I don't think we know anything about the other child. I like that theory too, about Lobster taking over the body of the corpses he marked, I imagine it might have something to do with Vril and a pirate origin. It really is mostly up to speculation, but Mignola mentioned a pirate family tree, and it would make sense given his pulp-like influences and the latest story arc. 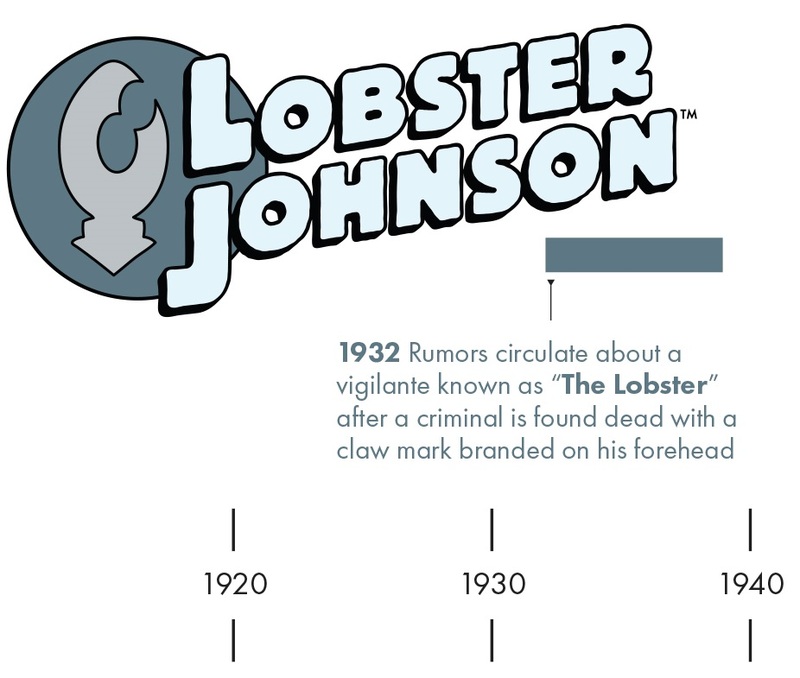 Not to be a downer, but I like how limited the Lobster's origins are. I have theorized about his glove's brand being a source of vril, though. But ultimately I like not knowing. I think our theories are potentially more fun. Oh I totally agree. The mystery of the character is a big part of the appeal to me, and I love that we still barely know anything about him 20 years on. The information about the pirates and whatnot is fun to speculate on but I like how open to interpretation it is. And I like your Vril idea! I like that as well, it makes him seem more mysterious, open to reader interpretation, and harder to pin down. It's kind of like when people argue about whether Michael Myers is supernatural or human or what. Sometimes a good mystery is better left alone, but I feel like the Lobster has one foot planted firmly in the real world or at least the pulp world and another in the supernatural. I like a good mystery too, but I also kind of like a good answer. I’d be happy not knowing who he is, but I’d love to understand a bit better if he’s actually a supernatural creature. Yeah once they start laying definitive answers down it's no turning back, and it runs the danger of lessening the characters inherit "coolness", so better get it right! I'm sorry, but I'm not quite understanding the reasoning behind your post being a straight reiteration of the previous post with a few words changed. For clarification, what is it you were trying to accomplish? I was trying to bait trolls...it worked! Well, they’re gone now. I should clarify that I was responding to a now deleted post. Last edited by zerodemon; 03-04-2019 at 06:52 AM. I don't know if that was a "troll" or just a potential spammer who was trying to establish themselves here first. They had another post in a different section that also seemed like a cut-and-paste-and-slightly-modify job. But, in "The Empty Chair" story in 2018's Hellboy Winter Special, the story has a dateline of "New York City, 1930" and we already have criminals who are aware of "The Lobster" and his branding? I wondered about that too - I remember John Arcudi saying that The Burning Hand took place "about a week" after the Lobster's crime-fighting career began. Maybe The Empty Chair is a slight retcon? Yeah, I asked Katii O'Brien about that. It's a deliberate retcon. I imagine the eventual Lobster Johnson omnibuses will lightly rewrite "The True History of Lobster Johnson" to match the new timeline.